Hope someone can help upto a week ago Hitachi pump worked a treat.It still works but doe's not kick in for age's I can have couple of showers if I unplug it the pressure in garden hose is very good allowing me to water the whole garden no problem. change the pressure sensing switch, a cylindrical devise screwed to the pump tank, takes about 5 minutes. Yup - also check for leaks around it as well, as it might not be priming. I had a similar problem with a mitsubishi pump. Try draining it down and refilling it. After a while they can become waterlogged. Drain down and refilling it worked a treat. I do this every 3 months or so. The pump switches itself on when the pressure is too low. So either the switch is defective which from the thread mentioned may not be the case or the incoming water pressure is just high enough to keep it off. Take the top off the pressure switch seen here bottom right with pressure written on it. It will either be a screw top or it has a screw holding it on. Underneath you with find a mechanism with a screw(green in the picture). Turn on a tap in the house and screw the screw down (clockwise) , say, 1/2 a turn and see what happens. Nothing try another 1/2 a turn. (Please bear in mind that the electrical terminals will be live) If nervous you can unplug the pump make the adjustment and then plug it back in. Nothing? Turn the screw back to its original setting and go 1/2 turn upwards,. If the pressure switch is sealed or the adjustment doesn't work. You'll need a new/different one. See the on/off reference on the side of the switch you need a bit higher on pressure. You will have to find a hardware store that sells Hitachi water pumps. Last edited by VocalNeal; 08-11-2015 at 10:59 AM. I tried messing around with the pressure switch also but it didn't work. Sorry I can't remember where I got the info from regarding draining down, it was about 2 years ago. ^ Pressure is pressure regardless of medium. Low water level in the tank is usually a cause of frequent cycling. But this does pose a question to the OP. When you say the pump does not kick in. Do you mean it does not start or maybe it does start but the water pressure does not increase? Call a little man wot knows. Question is a bit confusing re hose..is that your town water pressure with pump turned off? I have Hitachi relatively new. Depending on the model ,the kick start capacitor is perhaps shot. If you can you hear the motor 'humming' but not running when the water is turned on then that is the problem..replace it..inexpensive. Or, as mentioned the auto start pressure switch is not functioning. Unplug, take off cover....reconnect ..using insulated screw driver push down/flick contact lever arm ..motor should start...if not, power off then can try cleaning contacts ( old pump of mine had ants inside somehow) If not and you have ascertained capacitor is good then best unbolt water connections and take it a repair shop. From the way you describe it here it sounds to me that you have the pump incorrectly connected. The pump is switched on by a drop in pressure when you turn on the tap or shower, if the is no drop in pressure it will not switch on, and the reason for no drop in pressure could be due to the fact that you have the mains water going directly into the intake of the pump, so you are not getting the drop in pressure. Now as for it working a week ago that could be due to the fact that the mains water was at a reduced pressure at the time so you was getting the drop in pressure to kick in the pump. 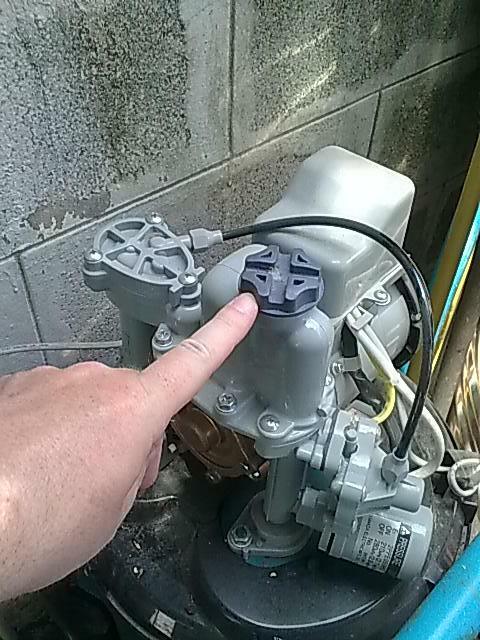 The intake for the pump should be connected to a water tank, and the tank having a mains water inlet to it. What you also need is a non return valve near you water meter so as to prevent your pump pumping water back out into the mains. Another thing to consider is that we've had a problem with ants getting into the pressure switch area twice now, in the past year. Not sure what it is in there that appeals to the ants, but they get in there. Just blow the area out with some air and see if that helps. Why do you want the pump to work when you don't need it?? The only 'problem' which fits your description (plenty of water pressure but no pump) is that your pump is connected direct to the mains water supply (illegal) and the mains pressure is now more than your pump can produce, as one poster has suggested. That's good news - no electricity charge for the pump, which you can turn off. The only real problem you've got is if you've taken any of the 'expert' advice here and played around with your pump. If you want to check if that's the 'problem' simply close the mains tap until your pressure drops and see if the pump starts. ... and remember, connecting a water pump to the mains is illegal (and selfish).